Hello! I had a chance to play with my new Sweet N Sassy Stamps set called Everyday Miracles that I got in the mail on Saturday! It's also available in digi form. I LOVE this set! The butterflies are Gorgous and alot of fun to color! I sprayed the white embossed layer with Shimmerz Babys Breath Spritz. The Butterfly is cut out raised up with pop dots. Thanks for stopping by and have a wonderful week! Oh WOW how gorgeous!!!! Love the flowrs and butterfly!!! Pretty, Pretty.... when I think of Sweet N Sassy, I think about visiting L&L! Stop that! Wow Janice, I just love this, great colors! Beautiful card Janice! 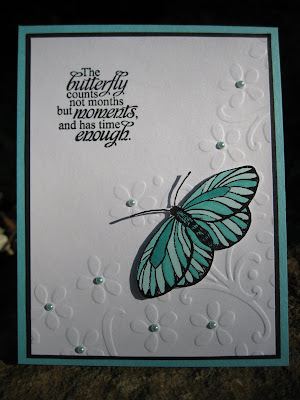 Can we showcase your card on the Sweet 'n Sassy digi blog this weekend? Contact me at ksdm@comcast.net for more details! I love the way you dressed up the embossed flowers! Wonderful card! Pretty colours.